"The Hard Bargain will rightly take its place on the top shelf of a large bookcase of memoirs about fathers and sons." With my brothers Barry (center) and Henry (right), I play the mariachis as we follow our father’s conducting. Backstage at the Metropolitan Opera House, with my father in costume as the poet Andrea Chénier, surrounded by my brother Barry (far left), my mother, Henry, and me. Auditioning with the great tenor, Lauri-Volpi (seated), with my father (far right) looking on. My mother lighting the candles on the Shabbos Eve in our home in Great Neck, Long Island, with (left to right) me, my father, and my brothers Barry and Henry. 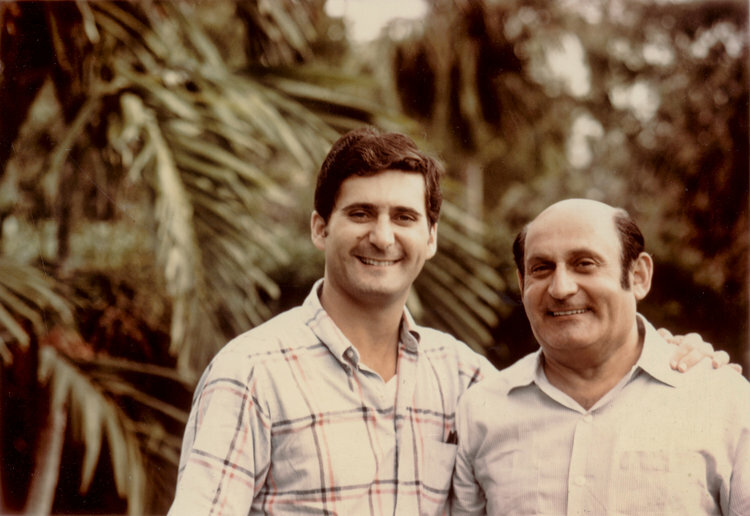 With my father, Richard Tucker, at a performance of La Juive. In surgical scrubs at the Jewish Hospital in Cincinnati, where I practiced medicine as an ophthalmologist for thirty-five years. Sign up with your email address to receive news and updates about the book, the play, readings and more! Dr. David N. Tucker is a retired ophthalmologist with degrees from Tufts University and the Cornell University Medical College. After an internship at Mount Sinai Hospital in New York City, he was a commissioned officer in the U.S. Public Health Service at the National Institutes of Health, doing research in infectious diseases during the Vietnam War. As chief resident under Dr. Edward Norton at the Bascom Palmer Eye Institute in Miami, he accepted a one-year fellowship with the eminent Colombian microsurgeon Dr. José Barraquer and with other prestigious ophthalmic surgeons in Europe. For over thirty years, Dr. Tucker was in private practice in Cincinnati and was the director of the Department of Ophthalmology at Cincinnati Jewish Hospital for twenty-seven years. After retiring in 2004, he taught part time as a clinical assistant professor of ophthalmology at the NYU School of Medicine. He and his wife Lynda celebrated their golden anniversary in 2013 and have four children and nine grandchildren. Burton Spivak received his PhD in American History at the University of Virginia where he was a Woodrow Wilson Fellow and a Virginia- Danforth Fellow, and taught at the University of Texas at Austin, Brown University, Bates College, and the University of Virginia. He is a former recipient of the Stuart L. Bernath Lecture Prize for outstanding achievement in teaching and scholarship, awarded annually by the Society for Historians of American Foreign Relations. His book Jefferson’s English Crisis: Commerce, Embargo, and the Republican Revolution (Charlottesville, Virginia, 1979) was included in C-SPAN’s American Presidents: Life Portraits list of twenty-five recommended books on Thomas Jefferson. Spivak also received his JD degree from the University of Virginia where he was on the Law Review and Order of the Coif, and practiced tax law in New York City for many years. He currently is an Adjunct Professor of History at Sacred Heart University in Fairfield, Connecticut. Marcus Center of the American Jewish Archives. “"The Hard Bargain" is mesmerizing as it reveals the extraordinary relationship between a world renowned celebrity and his uniquely talented son. The book gives a powerful portrayal of their complex relationship, their struggles, their deep respect for one another, their hopes, and their dreams. Above all, "The Hard Bargain" underscores the depth of their everlasting love for each other.